Yes, that's probably the first ever Subaru tank. We can't say for certain, but I think in this case we can go ahead and assume. Driven by none other then Ken "Gymkhana" Block. Why does it exist? To be the "ultimate backcountry shred car," of course. We think what that actually means is that you'll be able to not only access rather remote sections of your favorite mountain in the TRAX STI, but get there quickly and confidently, while performing any matter of black diamond stunts along the way. It combines a two of my favorite things in life: driving a rally car in the snow and snowboarding in the powder in the backcountry. It's incredibly fun having the ability to push the high-power Subaru on the slopes and to backcountry spots that normal cars could never go! We're just hoping that at some point old Kenny boy will give us a slushy hot lap or two. And be sure to check out 0-60's interview with Ken where the famed rally driver delves into more of his snow mania. Full press release explaining the madness behind the TRAX STI after the jump. The World's Fastest Cat Track Operation Automobile! November 2, 2009 - Vista, CA - On the heels of Ken Block's insane Gymkhana videos and the groundbreaking snowboarding/rally part to close out DC's MTN.LAB 1.5 video, the DC Co-Founder and Rally Team Driver has joined with Subaru to make the world's fastest cat track operation automobile for backcountry access for snowboarding. Dubbed the TRAX STI, a new teaser video from the test session for the highly-modified, snow-ready (to say the least) car is up on YouTube, and check out "0-60 Magazine's" Web site for an interview with Block and photo gallery featuring the best photos from the session. 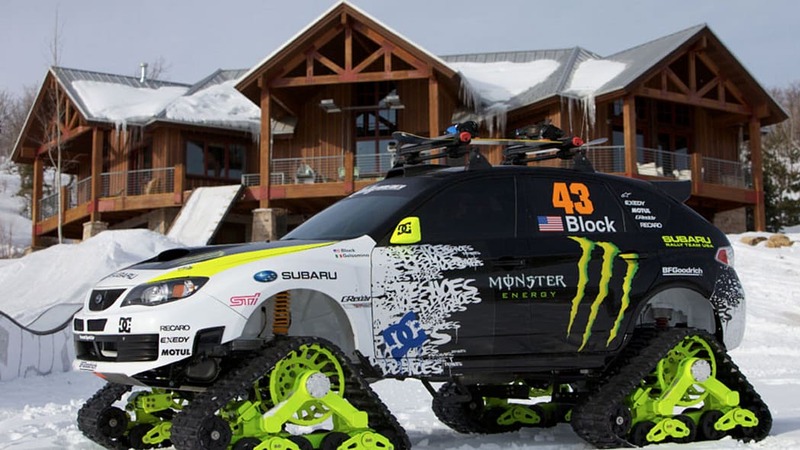 The TRAX STI is an experimental automobile that starts with Block's competition-ready Subaru WRX STI before ditching the tires, adding snow cat tracks, and upgrading to some next-level suspension to create the ultimate backcountry shred car. Prepared by Vermont SportsCar, performance modifications include 400-hp and features Group N competition rally dampers made by EXE-TC and a KAPS 5-speed close-ratio dog-engagement gearbox. Under the hood sits a 2.5 liter, 4-cylinder, turbocharged and intercooled STI engine tuned with a MOTEC M800 ECU. Completing the TRAX STI is a sleigh to be pulled behind the car, designed to hold four snowboarders, their snowboards, and all their gear. The sleigh's body is 100 percent custom designed and constructed of hand-laid fiberglass-though the sleigh is not seen in this teaser video, look for it in future videos next year. Altogether, this is one car ready for backcountry access and snowboarding. "The TRAX STI is a very fun project for me," said Block. "It combines a two of my favorite things in life: driving a rally car in the snow and snowboarding in the powder in the backcountry. Having a house in Utah (the DC MTN.LAB), I get to enjoy lots of sliding around on the snow, but this project takes that to a whole new level as I can now hit up the backcountry in the fastest snow cat ever. It's incredibly fun having the ability to push the high-power Subaru on the slopes and to backcountry spots that normal cars could never go!" But that was just the beginning. The new video posted this morning shows what went down in just one day of testing and driving the car. 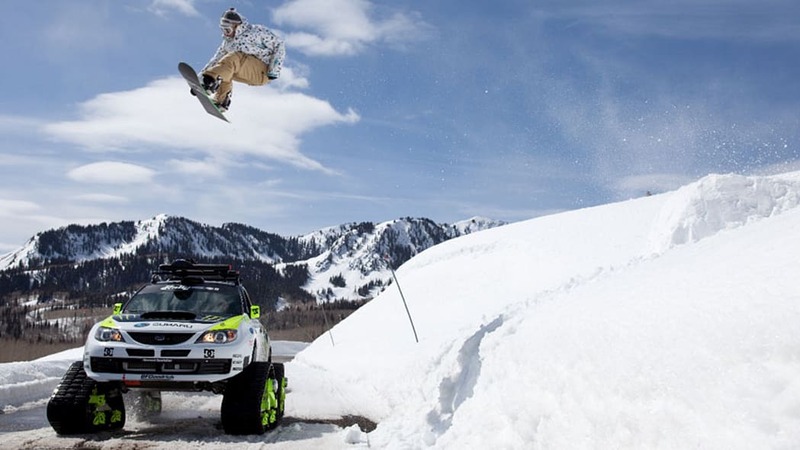 It shows the car in all it's high definition glory, as Block puts it through its paces up snow-covered mountains, down them, and even around un-expecting snowmobilers filmed at the DC MTN.LAB and Guardsman Pass, both in Utah. Stay tuned for more video to emerge as the car gets used more and more. "0-60 Magazine's" interview has all the behind the scenes on the TRAX STI, including the exclusive photos of the car. It's the place to learn more about the car, how it performs, and why Block had the darn thing built in the first place. View it here: http://www.0-60mag.com/online/?p=20459. The next issue of the magazine will have a two page spread featuring the car. Coordinating with the launch of this new video, DC is releasing new items from Block's TeamWorks Collection. Added to the already wide assortment of product inspired by Block and his rally racing endeavors, new items include a puffy jacket and a leather jacket. View the fresh goods now in the DC Online Store at store.dcshoes.com. http://store.dcshoes.com/family/index.jsp?categoryId=3631313.